Originally from Pennsylvania, Aaron received his permaculture design certificate at Naropa University in Boulder, CO, and has completed advanced design courses and his Teacher Training with Dave Jacke. Aaron fell in love with regenerative design the first time he saw an edible forest garden, and has been studying and creating them ever since. He lectures and offers educational events in Vermont and around the northeast. 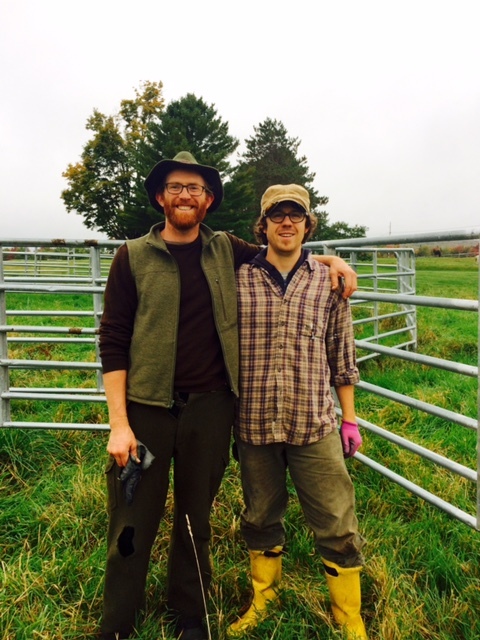 Aaron and his partner are based in Central Vermont, where they are searching for a permanent land base on which to grow a food forest and family. Graham grew up in East Montpelier and currently lives in Plainfield, VT. He raises grass fed and finished beef cattle with Aaron through Robinson Hill Beef, works in small farm advocacy and Policy through Rural Vermont, practices herbalism and educates youth and adults in these skills and relationships. Graham graduated from UVM with a degree in Religious Studies and Plant and Soil Science; has a Permaculture Design Certificate from Yestermorrow Design / Build School; and attended the 3-year clinical herbal program at the Vermont Center for Integrated Herbalism.